Q: Today, during his joint press conference with President Xi Jinping, President Trump said that China and the United States talked about the issue of Afghanistan and reached an understanding on this. Recently the United States has introduced the new South Asia policy and pressured Pakistan to crack down on Taliban. What kind of understanding has been reached between China and the United States? Can you provide us with more details? A: This morning, the heads of state of China and the United States held talks. The two sides believe that maintaining the stable and constructive relations between Afghanistan and its neighboring countries is of great significance to the peace and reconstruction process in Afghanistan. They support an Afghan-led and Afghan-owned peace and reconstruction process, call on all relevant parties in Afghanistan to achieve extensive and inclusive national reconciliation through political negotiation at an early date and stand ready to play a positive role through such mechanisms as the Quadrilateral Coordination Group of Afghanistan, China, Pakistan and the United States. 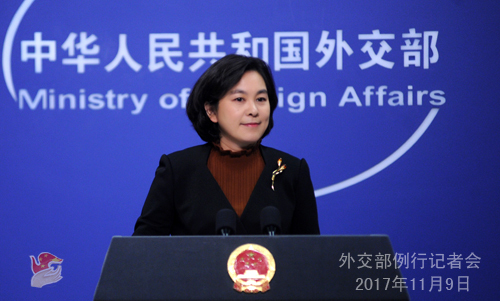 China and the United States have important shared interests in combating terrorism and upholding regional peace and tranquility. 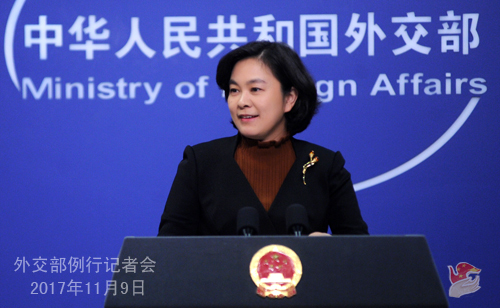 China stands ready to continue stepping up cooperation in this regard with the United States and other relevant parties. Q: We have noted that yesterday, accompanied by President Xi Jinping and his wife, President Trump and his wife visited the Forbidden City and President Trump said that this is unforgettable. This "state visit plus" arrangement has left a deep impression on us. 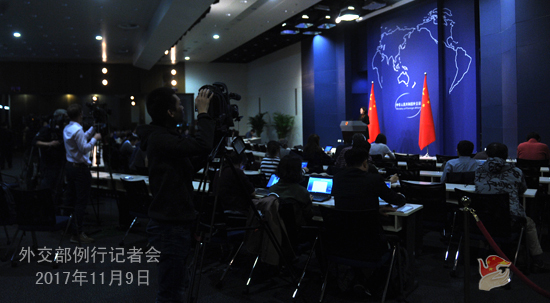 What is China's consideration behind the relevant arrangements? A: As is known to us all, when President Xi Jinping visited Mar-a-Lago this April, President Trump and his wife offered a hospitable and considerate reception to President Xi Jinping and his wife with high-standard and thoughtful arrangements being made in all respects. China is known as a nation of courtesy and we believe that courtesy calls for reciprocity. The Chinese side attaches great importance to President Trump's visit to China and it is only natural for us to do the honors and receive him in a hospitable and warmly manner. The Forbidden City embodies the extensiveness and profoundness of the Chinese culture which boasts a history of thousands of years and mirrors the vicissitudes of the Chinese nation over hundreds of years. It serves as an indispensable window to learn about the Chinese history and culture. The heads of state of China and the United States had an in-depth exchange of views in the Forbidden City, which can help to enhance mutual understanding and friendship and is of great significance to guiding and promoting the sustained, sound and steady growth of China-US relations in the new era. I believe you have also noted that yesterday evening, President Trump showed President Xi Jinping a video of his grand-daughter Arabella Kushner singing in Mandarin and reciting the Three-Character Classic and ancient Chinese poems. That video has been shared and reposted by Chinese netizens many times. As the little ambassador of China-US friendship, Arabella is adored by the Chinese people. This special arrangement is very sweet and heart-warming. I believe this can also help to bring closer the distance between the Chinese and the American people and build a closer bond between them.